A tip to be creative in cooking is to use what you already have in your fridge and food storage and make a dish out of it. 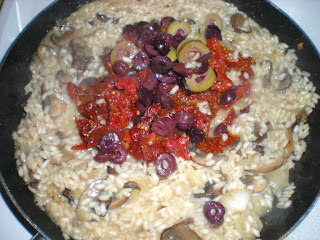 For this dish, I had some sun-dried tomatoes, olives, cremini mushroom, risotto rice and vegetable stock. Combine all together gives a marvelous multi-flavour dish. I love these kind of dish where each bite taste different from the previous one. I have to admit that it is not purely a mediterranian dish as I used cremini mushrooms. 1. In a large skillet, heat oil and melt butter over medium-high heat. Cook onion until transparent and mushrooms until soft, about 5 mins. Remove from skillet. 2. Add rice to skillet. Leave for 3-4 mins until almost translucent. Add garlic and cook until fragrant, about 1 min. 3. Add white wine and a ladle of vegetable stock. Let the rice adsorbed most of the liquid before adding more liquid, stir constantly. Continue in this manner until it gives a creamy consistency. After 3 ladles, stir in cooked mushrooms and onions. 4. 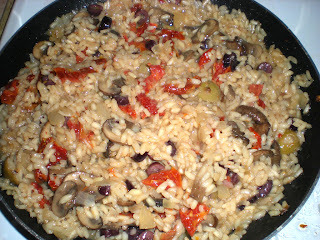 Once it is almost done, stir in sundried tomatoes and olives. Finish cooking the rice. For a richer taste, add butter or olive oil. Serve. This looks fantastic Victor! So delicious...I will try it soon! I wish I liked olives! I would perhaps omit the olives and add some green pepper. 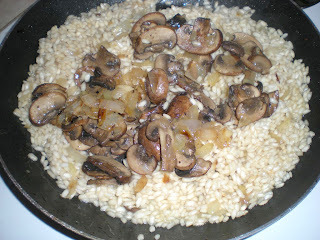 Risotto is a favourite meal of mine although I don't make it often as my son doesn't like rice. My Mom makes many versions, but the best is one that incorporates asparagus. Awesome Mediterranean flavors in this delicious risotto! This looks awesome i will try it!